With Windows 10, version 1803, we started to deliver language translation improvements via Local Experience Packs, also referred to as LXPs. Local Experience Packs are AppX packages delivered via the Microsoft Store that enable users to experience Windows features like the Start Menu, Settings, and File Explorer in the language of their choice. We also continued to support cabinet file-based language packs (lp.cab) and Language Interface Packs (LIPs) via language pack ISO files distributed with Windows 10. Beginning with the next major release of Windows 10, we are going to support LIPs as Local Experience Packs only. There will no longer be any lp.cab files for LIP. Local Experience Packs are faster to install and have a smaller operating system (OS) footprint. If you create Windows images with LIP, you will have to add the corresponding LXP for that LIP. For full languages, there is no change and you will continue to use the corresponding lp.cab. You can start testing Windows image creation using LXPs using Windows 10 Build 17723 or higher EEAP builds. We are providing LXP AppX packages and their corresponding licenses for all 72 LIPs in the language pack ISOs. The process will work like this. First, you will need to use the Add-ProvisionedAppXPackage cmdlet to add a Local Experience Pack to your Windows 10 image. Once you have added the Local Experience Pack to your image, you should see the following behavior. The LXP will show up on the language selection screen of the out-of-box experience (OOBE). When you select the LXP, all subsequent screens of the OOBE will be in the corresponding language. Since the LXP has only a subset of operating system strings available, some of the content in OOBE may fall back to the base language. This is on parity with current behavior. The first login experience post-OOBE should be in the selected language. How does this work for Enterprise organizations? Are you going to provide the LXP's in an ISO file or do all of them need to be downloaded from the store? What if we block the store? What are our options? Going forward LXPs will be part of the language pack ISOs. So if you are doing media based update on enterprise machines, you will be able to install LXPs from the ISO similar to how language packs are installed today. You do not need to go to the Microsoft Store. How does this change tie into MDT driven deployments? Current version supports legacy LPs - does this mean that a PowerShell-based wrapper is now required to install language packs at deployment time or will there be an MDT update to address this change? We are working on a MDT update to address this change. "You can start testing Windows image creation using LXPs using Windows 10 Build 17723 or higher EEAP builds. We are providing LXP AppX packages and their corresponding licenses for all 72 LIPs in the language pack ISOs." Where can i find the corresponding AppX Packages so i can install a language pack using DISM? The language pack on VLSC is an old one even if it says it has an updated date of 2/10/18. Please use the Windows 10 October 2018 release Language Pack ISO to access LXPs for LIP. I managed to download the language pack ISO but there's no EN-GB LXP? For creating Windows 10 October 2018 release image, use LXPs for LIPs only. Language pack ISO will have LXPs for all the LIPs. For full languages such as en-GB continue using lp.cab. If the user selects en-GB in OOBE then we will fetch the corresponding en-GB LXP from the Microsoft Store. The user will then get language improvements via store updates to en-GB LXP. Australia needs its own LXP; - using en-GB base, if input locale has not been properly set - the keyboard will default to en-GB which will cause issues for Australian users due to the standard keyboard layout in available in market is en-US. 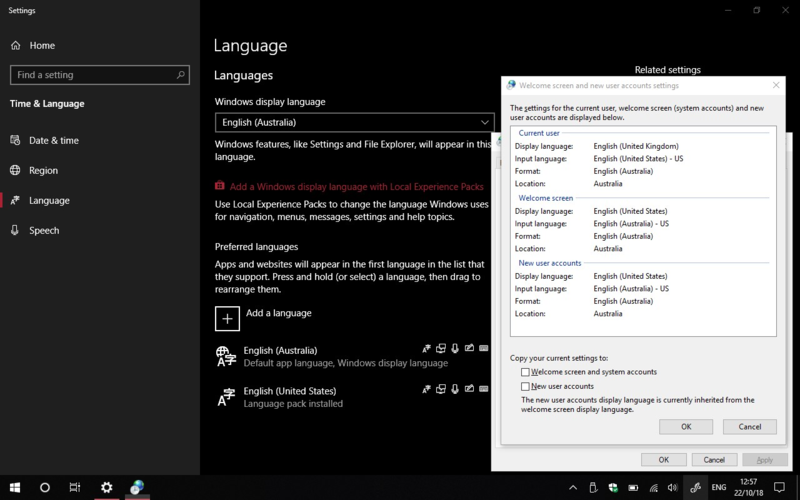 There are also problems when switching between LP/LXP and the Operating System itself lacks a definitive 'Language Pack' for Australia in the Windows Store - as the United Kingdom Local Experience will be downloaded to enable 'English - Australia' features and display language. This example highlights how en-UK is set for the Display Language but is absent in the Settings UI. Only en-AU and en-US appear as installed. This is a change that is causing some impact to the organizations that are offering images with multi language. In my organization we are creating a image with english + spanish, greek and german. On the past the users could change the language by theirselves using the control panel options and as far as I understood that is not possible anymore. We have the Windows Store blocked and if we install the lp.cab the control panel won't show the additional language as an option. It seems this is a new way to enforce the usage of the Windows Store which I can accept to the home customers but its hard to accept for enterprise users. Could you please clarify how can we create a reference image with additional languages which will be available to be selected by the end-users through the modern control panel? It has been said: "Where can i find the corresponding AppX Packages so i can install a language pack using DISM? The language pack on VLSC is an old one even if it says it has an updated date of 2/10/18." This is still unchanged, the VLSC does not offer new language pack ISOs that have an LPX folder. Could Pankaj Mathur tell me if MS has forgotten to upload those or where I can find them. Setting a language has moved from Control Panel to Settings app. Your users can now change the language by going to Settings app - Time & Language - Language. They do not need access to Microsoft Store to add any of the languages that you have pre-installed for them. I would like to get the steps to get those options available. As I have stated the language packs were installed but on Settings app - Time & Language - Language the only option that I have is English when I have installed the German, Spanish and Greek LP. The only way to change the language is using the powershell cmdlets. Please advise the right steps to achieve the configuration that you mentioned. In Microsoft Volume Licensing Center (VLSC) please look for Windows 10 Language Packs (Released Sep'18) 32/64 Bit Multilanguage ISO. ISO has LocalExperiencePack folder that contains 72 sub folders - one each for 72 LIP languages. For SKU languages, the ISO contains lp.cab as before. I think you are not understanding the behavior that we are seeing. We already got that ISO and I cannot find LXP for the languages mentioned (en-gb; es-es; el-gr). I already installed the lp.cabs but I can't see that options available on the UI Settings app - Time & Language - Language. I don't know if you already tried to replicate the issue but the I think you are not following the same steps. This issue is not happehing only in our organization. I have seen some comments reporting the same. Probably we are missing something but there is no information about the steps which makes everything hard. Please find the screenshots attached where you can see the lp installed and the only option available on the settings UI is English (United States). The languages that I have deployed with the lp.cab are not available on preferred language list. The only option seems to download the LXP from the Windows Store, which is blocked. Nevertheless that should not be an option even if it worked since the main goal is the automation for the reference image creation. As Milen recommended, in 1809 you will have to add the language to the preferred list as it will not show up in the Windows display language drop down. We are working on making the pre-installed languages show up in the Windows display language dropdown so expect to see that in future releases. For now, please click on Install after you see offline error message. That should add the language to user preferred language list as well as make it available in the Display Language dropdown. For SKU languages, you do not need to get the LXP or connect to the Microsoft Store. All 3 of the languages that you are installing - en-gb; es-es; el-gr - are SKU languages. You can read more about LXPs here: Local Experience Packs: What are they and when should you use them? Following the steps mentioned I can see the languages available on Windows Display Language drop down. Is there any automation that can be done in this case or is this will require manual steps? Is this bug/feature/behavior documented somewhere? Big thanks to Valter that's just describe the situation where i'm and could get an answer from Microsoft. I'm a consultant and i'm currently implementing MDT and a multilanguage Windows Enterprise 1809 for one of our customer. After testing and spending hours to by-pass this problem, I need an official statement for this issue/feature/change to document and justify the time spended. Could you please provide a link to an official statement on that? Hi, I must add Windows 10 Enterprise Version 1809 (en-us) install.wim other language packs and language packs interface (LIPs or LXPs) finnish and swedish. I try to find out from LanguagePack ISO and there Local Experience Packs but there is not fi-FI and sv-SE folders, why? How I can add these languages to my OSD install.wim, that finnish user can select Finnish and swedish user can select Swedish and other users use English? I read that it must add by Windows Store but how is possible to Reference image? I dont know what i must do, please can anybody help me? This is interesting, and I am continuing to follow this thread as I have many of the same issues, tasks to complete the 1809 install (with Language Packs) in my organization. It is not as easy as it once was. Both Finnish and Swedish are SKU languages and therefore for both of them you will be installing lp.cab just like in the past. The lp.cab for both of these languages are available in the language pack ISO. Hi Pankaj, thanks your answer about this My problem, I will be test this tomorrow and I hope that it works, because I think that I was try this before and I get error messages when I ran DISM command. I will be back If it works or If not and attach screenshot about errors. This is the biggest mess I have ever seen. Microsoft. Are you kidding us? Are you still considering and developing for enterprises or only for end users? We are an English global company with more then 90 offices worldwide which is using 99 percent English only Windows 10 image to simplify support but of course we need localized keyboard layout and language features like basic typing (e.g. for Japanese users with IME support) handwriting recognition (for tablets), text-to-speech, speech or ocr which are not in the normal LP.iso but in the FOD Disc1.iso as they are "Microsoft Windows Language Features" but if you select e.g. the Japanese LPX from the store it also includes these components. When I look into the "LocalExperiencePack" folder of the SW_DVD9_NTRL_Win_10_1809_32_64_ARM64_MultiLang_LangPackAll_LIP_X21-91305.iso I cannot see the LPX for Japanese and many other limportant languages like German etc. but they is available in the MS Store as LPX files!!!! Why are you doing this? Why is the "LocalExperiencePack" subfolder of the LP.iso incomplete? How should an enterprise automate this configuration for a Japanese user? Especially as our users do not have Admin rights on their machines because of Security reasons and cannot go to the store and add these components by themself. Why does a simply language addition via the Settings app or MS store requires admin rights and the UAC pops in? Especially as such a Langage addition is a not a machine but a user only (profile setting). Again - a complete mess! You developing for end users only and change things which are use less for enterprise or even worse create unsolvable trouble for them. I can not see any stringent strategy in the topic at Microsoft. Especially as MS discontinued the option to offer LP and FOD is WSUS since Windows 10, version 1709. Now you can only download directly from Microsoft store servers. 1. Go to Computer Configuration => Policies => Administrative Templates and then System. 4. Make sure “Download repair content and optional features directly from Windows Update instead of Windows Server Update Services (WSUS)” is checked. Besides you need to consider, that the auto-download of FOD components only works if your user has admin rights - otherwise you see the LP sub components like "Basic typing", "Handwriting" or "Speech" in the Language Options window of the Settings apps but they are not downloaded - even if you click the "Download" buttons you don't get any error message or feedback - very poor UI design Microsoft! Again - a complete mess! You are developing for end users only and change things which are useless for enterprise or even worse create unsolvable trouble for them. @snruebes : Thanks for providing your feedback and explaining your scenario. Please see response to your concerns. 1. LXP for Japanese and other languages is missing in ISO: We are on the journey to replace lp.cab with LXPs. Starting in 1809, for all LIP languages lp.cab has been retired and LXP is the only way to install them. For SKU languages or full languages such as Japanese, you still need lp.cab. Therefore the ISO contains LXPs for LIP and lp.cab for SKU languages. In 1809, for SKU languages we are using LXPs to provide translation improvements but the base translations are always in lp.cab. So in 1809 continue using lp.cab for SKU languages that are provided with the ISO. 2. Adding language requires admin account: Starting in 1809 we are removing this restriction and non-admins can add Windows display language via Settings app. 3. Language FOD UX design and workflow: Thank you for your feedback on that. Our product teams are looking into making this experience better. I had the same Problem, creating a multilanguage Image for WIn10 1809.
there is a "VDA Language Pack" available. Within the ISO there is the e.g. : .\x64\langpacks Folder where the complete language packs reside. With this language packs you are able to create a Multilanguage "all-in-one" Image with all the FOD's and languages you want. I´m trying to add a language via settings in 1809 but I´m still prompted for admin rights. When can we expect a change in this behaviour, it is extremely inconveniant.